07 March 2017, MWENEZI - About 270 girls at Lundi Christian High School were forced to swiftly vacate their residences on Monday after fierce waters from the flooded Runde River engulfed the tributary that bisects the main campus and the girls' hostels. Twenty-two members of staff staying in houses that are on the same side with the girls hostels had to spend the whole of Monday stuck on that side as the small stream could no longer be crossed. 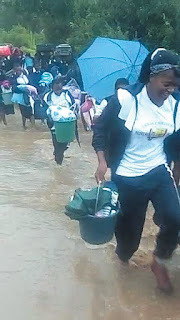 Sources at the school told TellZim News the decision to move the girls out of their hostels and accommodate them in classrooms was taken after the realisation that the hostels were in danger of being flooded. "When we realised that water levels were increasing at an alarming rate, we ordered the girls to take their few belongings and some blankets. As soon as all of them crossed to the other side, the stream that divides the hostels and the classrooms side was immediately flooded. They spent the night sleeping in the classrooms," said a source. On Tuesday, this reporter saw school uniforms hanging on classroom windows with authorities admitting that the case was bad as the girls could not return to their proper accommodation at least in the short run.